There will be a startling upset in the race for Best Drama Series at the Emmys this Sunday (ABC, 8-11 p.m. ET), according to the experts polled by Gold Derby. 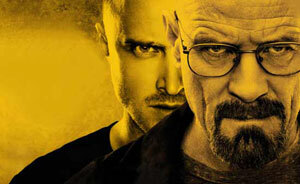 Breaking Bad will break loose and overtake the category's longtime champ. Up until last week, Mad Men was favored to take the top prize for an historic fifth time, but enough pundits have changed their predictions in the Emmy home-stretch to trip up the expectation that Mad Men will continue undefeated. Now Breaking Bad has 6 of 15 experts betting on its victory: Lynn Elber (Associated Press), Maria Elena Fernandez (Newsweek Daily Beast), Rick Porter (Zap2It), Paul Sheehan (Gold Derby) and Ken Tucker (Entertainment Weekly). Mad Men is close behind with five pundits picking it to win: Debra Birnbaum (TV Guide Magazine), John Kubicek (BuddyTV), Daniel Manu (Television Without Pity), Mo Ryan (Huffington Post) and me. Three prognosticators choose Homeland: Robert Bianco (USA Today), Maggie Furlong (Huffington Post) and Jill Serjeant (Reuters). Only Matt Roush (TV Guide Magazine) believes Downton Abbey will reign, but I personally rank it in close second place because it was a superhit with the Cool Crowd and it proved to be a winner at last year's Emmys. Oh, yeah, Downton also has those suave British accents - people are suckers for that in barbarian Hollywood. Meantime, over in the race for Best Comedy Series, nearly all of the experts pick Modern Family to triumph for a third consecutive year. The only naysayer is Maggie Furlong, who opts for Girls. In the acting contests, Bryan Cranston (Breaking Bad) and Claire Danes (Homeland) are widely favored to snag the laurels for Best Drama Actor and Actress. Leading the equivalent comedy contests are Louis C.K. (Louie) and Julia Louis-Dreyfus (Veep). Below, a breakdown of how many experts are betting on each nominee. Here are the racetrack odds in each competition.